There are many different versions of Frankenstein. They range from the classic film with Boris Karloff to hilarious Young Frankenstein starring Gene Wilder. It has been 200 years since his first appearance. What fascinates us with this monster? 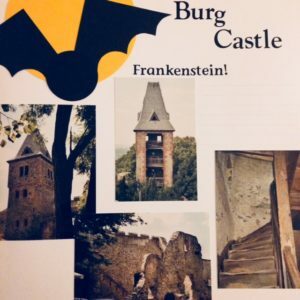 On a trip to Germany in 2002, my family and our German family visited Frankenstein Castle outside of Darmstadt, Germany. Even though it is not the actual home of the monster it is still very formidable. I could easily picture the Gothic tale happening in the ruins. First line: Lightning clawed across the sky, tracing veins through the clouds and marking the pulse of the universe itself. 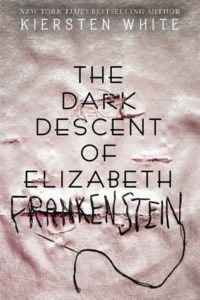 Summary: In this retelling of Mary Shelley’s classic novel, Frankenstein, we see the story unfold through the eyes of the Frankenstein family’s ward, Elizabeth. She is brought to Frankenstein manor as a playmate and helper to the strange eldest son, Victor. As they grow up the two become dependent on each other. However, when Victor disappears with no word, Elizabeth must search for him and bring him home. When she finally finds Victor, she learns the truth of what he has been doing those many months he has been gone. She has kept his secrets for years but can she keep this one? Highlights: Kiersten White did a great job of fleshing out the story and adding to the original. I think that she made it even darker than the original. Which I really loved. I liked the character of Elizabeth. She was secretive, cunning and not shocked by the things that Victor did. For a woman of the time she relied on the men in her life. She tried to guarantee that she would be taken care of by any means necessary. Lowlights: I read Frankenstein several years ago and was not as impressed as I had wanted to be. I love to read classics. I love Dickens and Stoker. I listened to the audio version and it was rather slow moving for the first two thirds. There is more description and little conversation. The last third was more engaging and fast paced. I would recommend reading this one instead of listening to the audio. FYI: If you love Frankenstein then you should read this!